When the Middle Years Programme (MYP) e-Assessment launched in 2015, it represented an important milestone for the IB. It was the IB’s first major step towards digitization and truly tested the student’s ability to apply understanding, rather than just memorizing facts. Many schools were excited to be involved. The onscreen exams are designed to support access and inclusion. Accessibility was carefully considered from the outset, says Dr Kala Parasuram, IB Access and Inclusion Manager. But there wasn’t a Braille version available, which student Marie-Ève Letourneau needed in order to sit her eAssessment in 2017. Marie-Ève, who is blind, caused by a degenerative disease, attended École Pointe-Lévy in Lévis, Québec, Canada. MYP coordinator Manon Tessier informed the IB assessment team back in 2015 to ensure everything was in ready for Marie-Ève by 2017. It was a request that caused the IB assessment and inclusion team to rethink the entire exam. A few years ago, the IB made a strategic decision to make the onscreen environment completely accessible for a student with vision impairment rather than produce a Braille paper version of the examination. When the IB gets a request for vision impairment in the IB Diploma Programme (DP), it’s easier to fulfill because those processes have been in place longer, explains Dr Parasuram. “All we have to do is inform our examination production team and Braille modifiers look at the examination and change what is needed – not the content of the question, just in terms of adapting it in order for it to be Brailled – then a Braille version is sent to the student. As many of the subjects in the MYP include a great deal of visual processing, lots of careful preparation was needed to ensure it was a fair process and free from any prejudice. They decided there were three options to make it inclusive for visually impaired students – change the question in the standard version, such as removing unnecessary imagery, for example; adapt the presentation of the question; or use tactile materials, especially for graphics presented in physics and mathematics. Marie-Ève was also given access to a human reader at all times, and she excelled in her exams. She is now in college. Tessier adds: “The examination was fair to Marie-Ève. She is such a brilliant student and we didn’t want this to cause her any prejudice. She adapts quite easily to any situation. Marie-Ève found the E-portfolios (coursework) in language acquisition and physical education the most difficult. “In language acquisition, criterion A and B were difficult because of the visual part. In physical education, it was hard to choose sports that Marie-Ève could do,” says Tessier. Marie-Ève will be remembered for years to come at École Pointe-Lévy. 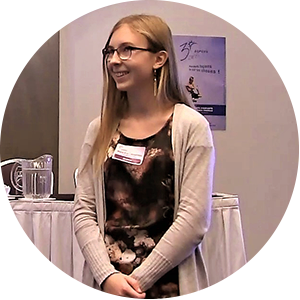 For her MYP personal project, she built a conference for parents of blind children starting high school and presented it to an organization of parents of blind children. Visitors to École Pointe-Lévy have seen Marie-Ève’s work in the personal project exhibition and voted it their favorite and most impressive. As École Pointe-Lévy revels in Marie-Ève’s success, the MYP department is preparing for this process again. Marie-Ève’s brother, who also has the same visual impairment condition, will be sitting the eAssessment in 2019. However, he does not use Braille yet so Tessier and her team are not yet sure what modifications will be needed. But the IB is ready to make the process a smooth one. 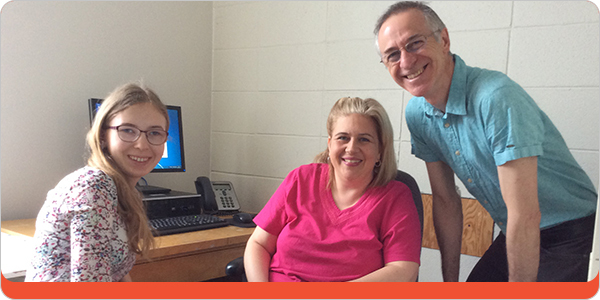 “Because of Marie-Ève’s experience, we are prepared and have a roadmap to make our eAssessments accessible for any environment. We have all the right processes in place,” says Dr Parasuram.